Rachel Dagget was named the inaugural recipient of the Helen Ryan Collins Memorial Scholarship in Irish Studies by the Center for Irish Research and Teaching. The Helen Ryan Collins Memorial Scholarship is awarded each year to a student that has been recommended by a faculty member, has a passion for Irish culture, is in good academic standing, and has a financial need. “She truly meets the criteria of the scholarship. She is a conscientious worker who’s delightful to interact with,” said Director for Center for Irish Research and Teaching Howard Keeley. 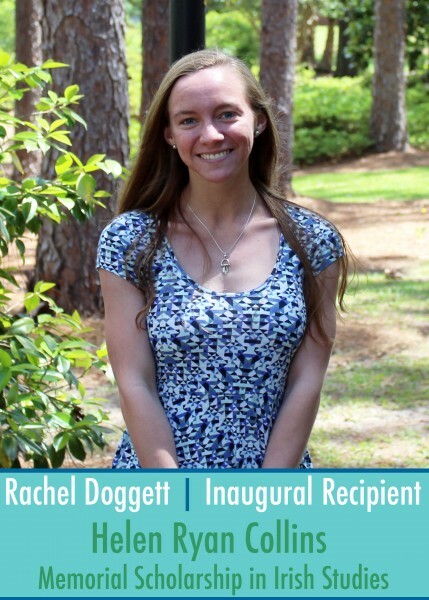 Dagget hails from Americus, Ga., and is minoring in Irish Studies. She is also pursuing a double major in English and Writing and Linguistics. The Helen Ryan Collins Memorial Scholarship was endowed by Tom Collins and his family to honor the memory of his mother.